This grand city is dedicated to the Brass Dragon, who rules it benevolently from afar. It is a city of scholars, learning, and education, where literacy is common and great libraries compete to uncover the newest arcane secrets. 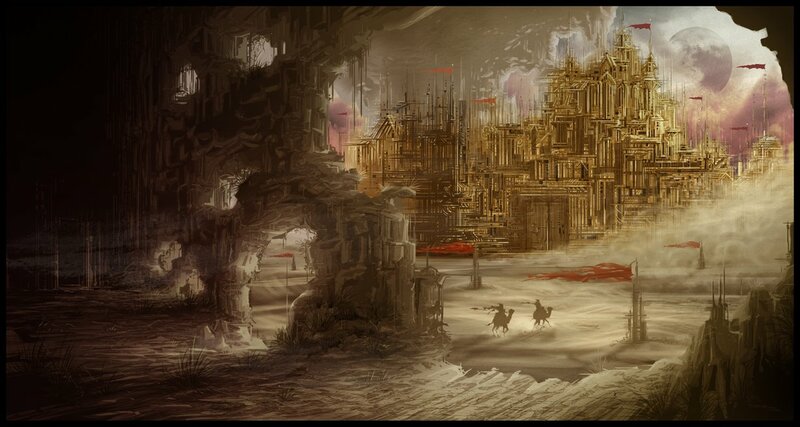 It is also a city where the monstrous mixes with the mundane: sphinxes stand guard over many of the grandest libraries, and a team of djinn loyal to the Brass Dragon keep the city in good repair and supplied with food and water (and guard it from the fierce sandstorms that ravage the area). The city is oddly nocturnal, with most residents spending the heat of the day sleeping, and working in the cool night under the light of stars, the moon, and lamps. The winds here are gentle and cool, and are engineered to be that way by the city's keepers. The draconic scions here protect the town from desert animals, keep the water supply high, and ensure that the city remains at a reasonable temperature. Many are assisted by djinni loyal to them. If the city comes under attack, the inhabitants create massive sandstorms to obliterate any invading army, on foot or on wing. Individual threats are more commonly dealt with by using sleep gas and enchantment magic. Most of the people in the City are human. There's also a significant minority of gnomes, who come for the deep learning that the city can provide. The smattering of other races includes elves, dwarves, and halflings. There's also a significant population of free djinn in the city, though most are tasked with some purpose or another by their pact with the brass dragon, and with the people entrusted with its power. Air Elementals, often working alongside the djinn, but just as often bound to some service or item. Sylphs living in the highest towers of the city. Their population changes regularly, as they are a people with great wanderlust, but a small aerie of them is always present. They don't get along well with the gnomes. Sphinxes occupy many of the great libraries here, including the foremost Five Libraries, the greatest collections of books in the world. They serve as guardians to a certain degree, but this is only to pay for their right to occupy the space and learn all they can from the tomes here. Most sages are happy to share their knowledge with these enigmatic creatures in exchange for some robust security. It is said that ghuls occupy the catacombs and sewers under the city, and more than one person has been lost exploring those dismal caverns. Rumors persist of a mummy that rests in one of the libraries itself, its bandages said to be magical script that the scholars are deciphering. A lamia undoubtedly prowls in the wastes just beyond the city gates. None have been able to exterminate her yet. The kokrah, a vulture-like outlander people of hunters and shamans, occupy some of the cliffs near town. They are fairly hostile to the travelers here, as they resent the city's control of the air space.